News - Varley USA, Inc.
Johnstown, PA, May 21, 2015 – The Varley Group of Australia and its subsidiary, Varley USA, Inc. have formed a strategic alliance with Concurrent Technologies Corporation (CTC) and its affiliate, Enterprise Ventures Corporation (EVC). Varley Group is one of Australia’s oldest and most advanced engineering companies. The strategic alliance will extend the Varley Group’s business in the United States in three key areas; Aerospace & Defense, specialized vehicles, and advanced electric motor and generator technologies. It is a truly trans-Pacific partnership which will bring high-quality jobs and new business to the U.S. The Varley Group, one of Australia’s oldest engineering companies, announced Nov. 11 the launch of a U.S. subsidiary to extend the groups business within the United States. NEWCASTLE, AUSTRALIA, November 12, 2014 – Varley Group, one of Australia’s oldest and most advanced engineering companies with over 128 years of history serving a diverse range of industries such as defense and aerospace, specialized vehicles, electric vehicles, power services, ship repair, rail services and telescopic towers, announced today that it has selected 90Degrees of Design to support the parent company in its corporate branding efforts as it launches its US-based subsidiary, Varley USA, Inc.
Jeffrey Phillips, Managing Director of the Varley Group of Australia, announced that Dan Dragoi has been appointed Vice President, Global Business Development of Varley Group’s American subsidiary. As VP for Varley USA, Mr. Dragoi is responsible for the organic growth effort including sales, marketing, and customer relations, ensuring that Varley USA reflects the world-class quality and support of the Varley Group. 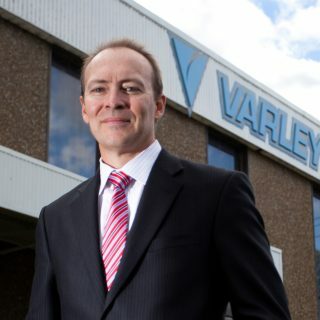 Varley’s work on projects, large and small, has earned the company a reputation; locally, nationally and internationally, as a supplier of first class work, a manufacturer of quality products and a provider of unsurpassed service. Its broad but specialized skill-base, acquired through experience and servicing a diverse range of markets gives the company the competitive edge in providing quality customer service. About Varley US: Varley USA is the US subsidiary of an Australian Engineering Services company. It is headquartered in Washington, DC and is focused on making strategic acquisitions as well as building US business based on Varley’s broad array of technologies, capabilities and experience. Varley US has offices at 1101 Pennsylvania Ave. in Washington DC. For more information about Varley US visit our website at http://www.varleygroup.us.